For anyone trying to master cursive handwriting, there is a good chance they have developed speed rather than beauty in strokes. As such, it may be a good idea to go back to the basics, back to manuscript writing because chances are they didn't master manuscript writing either. While manuscript writing is a different style of writing, it does teach you how to space letters properly and how to stroke your pen on the paper. It teaches you the basic art of writing, allowing you to learn to properly form letters. Once you can form letters correctly, switch to cursive and learn how to properly connect the well-formed letters. You will have good handwriting in no time at all. What most people don't realize is that no two writing utensils are ever the same. For example, writing with a ball-point requires you to apply a bit more pressure than gel or ink pens. That's why you need to select a pen which is perfect for you. For those learning to write with a pen, try a pen which has a rubber grip on it. This grip will teach you how to hold a pen and provide comfort during prolonged writing. 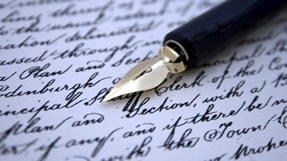 Cursive writing is possibly the most popular style of writing. However, if you have trouble with cursive writing, try switching to manuscript. If the aim is to have good handwriting, it doesn't matter what type you use, so long as your writing can be understood. Believe it or not, most people cannot grip a pen properly. Over time, they develop a grip that works for them at times and doesn't at others. As a result, they end up writing by moving their fingers rather than their wrist. Not only does this hinder the quality of their writing, it creates discomfort when they write for longer sessions, such as during exams. For those who want to have good handwriting, hold your pen between your thumb and fingers with a firm amount of pressure. Remember, the pressure should be enough to hold the pen firmly but not so much that you feel discomfort in your fingers after a while. Most people practice set words and phrases in order to improve their handwriting. Good handwriting can be used to write anything so why not practice by writing anything? Whether it's a word, simple letters, phrases or entire random sentences, the key to having good handwriting is to continue practicing. More importantly, you need to continue writing. The handwriting of a good majority of people suffers because they spend too much time away from writing. That's why even if it's a small letter or angry note, continue to write. Having good handwriting requires you get back to the basics if need be, practice your curves and write just about anything you can think of. In no time at all, you will see your handwriting improve. You will be able to write better, faster and for much longer periods. Visit www.masterhandwriting.com to find out how you can improve your handwriting in minutes!